Are you tired of the normal and traditional decorations that all Indian weddings use? 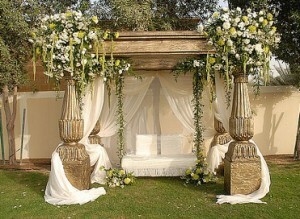 We have some exciting ideas for Indian wedding decorations on your wedding day. Decorations are indeed very important for all weddings in India, In fact, the décor used for the weddings sets the mood of the function and hence it is very important to transform the wedding hall completely from dull hall to the dream venue of your wedding. There are absolutely no rules that you have to follow when you are choosing Indian wedding décor. You can choose the style and ideas from anything around you. You can make it as simple or as complex as you want it to be. You have to tryout with several materials like paper, glass, fabric or anything else that can make your decorations special. Origami hangings in vibrant colors is becoming very popular for wedding decorations in India. Certain flower decorations made out of simple colored paper looks so beautiful as wedding props.There are several interesting ways to using simple fabric of linen and satin to decorate the tables and chairs that you are using in the Indian wedding hall.How about using lace for your wedding decorations in India? Using lace in your wedding décor can make them really beautiful and also adds a antique charm to the whole wedding decoration setup.Choose unconventional colors for your decorations. If you have got a good sense of colors, then play with several decoration ideas using flowers, fabrics or just paper. Mismatched traditional furniture can also make great props for your Indian wedding decorations.You must try the Internet for a vast variety of ideas for Indian wedding decorations. You will find a wide range of interesting options and just go for one that you think will look best for your wedding hall. This entry was posted in Free Online Invitation Tools, online wedding tools, Party Planners in India, Party Venues, wedding party gift ideas, Wedding reception venues Bangalore, Weddings in India.